Realty Income (O) was founded in 1969 and is one of the largest REITs in America. The company owns more than 5,600 properties located in 49 states and leases its buildings to 260 commercial tenants operating in 48 diverse industries. In recent years the REIT has begun diversifying into non-retail properties, including offices (4% of rental revenue), industrial warehouses (12%), and farmland (2%). However, retail properties still generate 81% of total rental revenue. All of the company's properties are under long-term triple-net lease agreements, which provide solid cash flow visibility and shift property operating expenses such as maintenance, utilities, insurance, and taxes to the tenant. In other words, the rental revenue received by Realty Income has substantially fewer expenses and more stable net cash flow compared to REITs with a smaller mix of triple-net leases. As a result, the firm's margin is among the highest of any REIT. Realty Income has paid uninterrupted dividends since its founding 50 years ago and has increased its dividend for 25 consecutive years. Few companies have maintained as strong of a dividend growth track record as Realty Income. The REIT's success is driven by its diversified portfolio, disciplined capital allocation, focused business strategy, and strong financial health. These factors have combined to create an extremely resilient business. Realty Income’s long-term growth has been nothing short of outstanding. Since 1994, the company has grown its real estate assets (at cost) from $451 million to more than $15 billion; expanded the number of industries served by its portfolio from 5 to 48; increased its number of commercial tenants from 23 to 260; and boosted its annual revenue from $49 million to over $1.3 billion. Management’s growth strategy over this time has been very focused. The company leverages its relationships with tenants, property developers, brokers, investment banks, and other parties to source acquisition opportunities with strong initial cap rates (the cash yield on an investment) and built-in rent growth. Realty Income will only purchase freestanding, single-tenant properties located in big markets and/or key locations that it can lease to tenants with superior credit ratings and cash flows. In fact, tenants with investment-grade ratings account for 51% of total revenue, and its average tenant rental coverage ratio (operating cash flow/rent) is 2.9, which is very healthy for this industry. The retail business is very much driven by location, and Realty Income’s portfolio clearly plays to this critical success factor. The company’s occupancy rate has never dipped below 96% going all the way back to 1992, even during the financial crisis. Sustained high occupancy rates signal the high quality locations of Realty Income’s properties and the financial strength of its tenants, which have helped the firm recapture more than 99% of prior rent on re-leasing activity since 1996, protecting cash flow. Equally important, Realty Income is not betting on any one client or industry for its future success. After all, a high occupancy rate is of little value if a single tenant accounts for a major portion of rent (e.g. 15%+ of total rent) and goes under or decides to walk away after its leases expire. 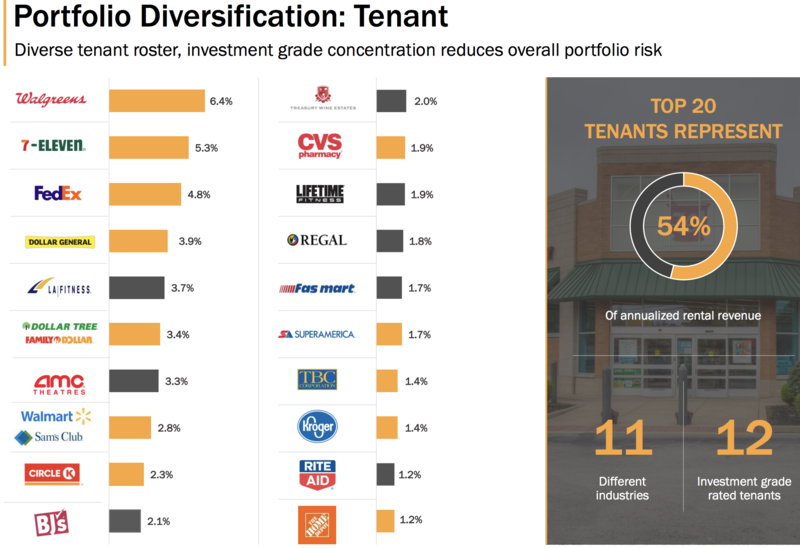 Realty Income’s largest tenants by rent are Walgreens (6.4%), 7-Eleven (5.3%), FedEx (4.8%), Dollar General (3.9%), and LA Fitness (3.7%). Its three largest industries by rent are convenience stores (12.1%), drug stores (9.9%), and dollar stores (7.4%), and no state accounts for more than 10% of total rent. Importantly, Realty Income focuses on leasing to tenants that have a service, non-discretionary, and/or low price point element to their business. Over 95% of the company’s total portfolio rent is from tenants that possess at least one of these components or only have non-retail operations. In other words, these tenants are seemingly better positioned to survive a variety of economic conditions and more effectively compete with the continued rise of internet retailers. 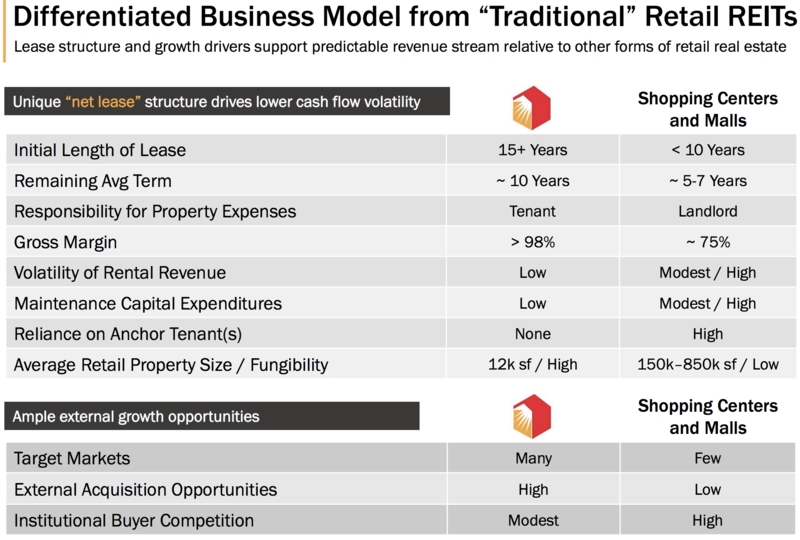 Simply put, Realty Income's business model is very different from shopping center and mall REITs, which face greater uncertainties and have higher risk. As previously mentioned, investment-grade-rated tenants also account for just over 50% of Realty Income’s total annualized rental revenue. All of these characteristics combine to create a durable and stable stream of rental revenue. Realty Income’s lease renewal schedule is also favorable. Less than 25% of its rental revenue is up for renewal over the next five years, and no more than 10% of its total rent is up for renewal any single year through 2031. The company’s weighted average remaining lease term is also over 9 years, and most of its contracts have annual rent increases built in (usually 1% to 1.5% annually). A final strength of Realty Income’s business is its own financial health. REITs are required to pay out almost all of their taxable income in the form of dividends, leaving very little capital for reinvestment. As a result, REITs primarily rely on external financing (i.e. raising debt and issuing shares) to fund their property acquisitions. In fact, Realty Income's share count has more than tripled since 2005 to help fund its property acquisitions. Realty Income targets a conservative capital structure with more than 70% equity and less than 30% long-term debt. Nearly 90% of the company’s debt has a fixed interest rate, which protects near-term earnings from rising interest rates. Its debt maturity schedule is also well laddered, reducing refinancing risk, and its leverage metrics are healthy. As a result, Realty Income has earned an A- credit rating from S&P and enjoys a relatively low average interest rate of 3.9% on its debt. This financial flexibility helps the company secure relatively low-cost funding to finance property acquisitions, providing it with another advantage over its rivals. As long as Realty Income continues to have access to external financing for growth, there should be no shortage of properties for the company to acquire. The total size of the single tenant retail property market is estimated to be approximately $1 trillion, according to National Retail Properties. Realty Income’s revenue sits near $1 billion, leaving plenty of room for future growth. Overall, it’s hard not to like Realty Income’s business. The company owns thousands of extremely valuable retail locations; is diversified by tenant, industry, and geography; maintains a conservative capital structure; has plenty of opportunities for future growth; and has a long track record of creating value for shareholders. Realty Income will likely remain a force for many years to come. 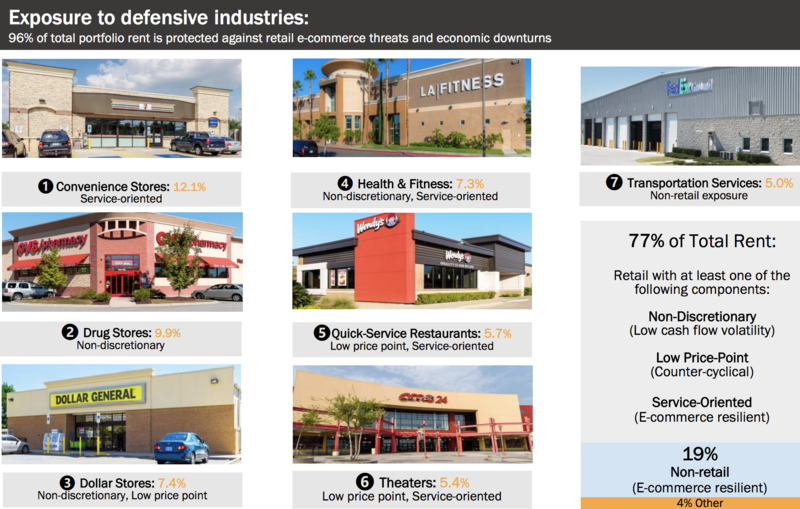 The company’s diversification, financial conservatism, and focus on quality tenants and defensive, Amazon-resistant industries eliminate many fundamental risks faced by other retail REITs. However, Realty Income is significantly exposed to the consumer retail sector (81% of total rent), which is constantly evolving due to changing consumer preferences and the continued rise of e-commerce. While it has done a great job of shifting its tenant base to relatively e-commerce resistant tenants over the years, there is always the risk that omnichannel could eventually reduce the importance of certain physical locations. Perhaps in the future companies will merely use their physical store locations as delivery and return points for increasingly online driven sales, for example. Fortunately, Realty Income is not overly exposed to any single industry. For now, it seems unlikely that the continued rise of e-commerce would materially impact demand across many of Realty Income’s tenants, much less jeopardize their ability to continue making rent payments. Another risk to consider is how long the REIT can maintain its historical 4% to 5% annual growth rate. While the U.S. real estate market is large and fragmented, allowing for plenty of new acquisition opportunities, Realty Income's increasing focus on top quality properties and tenants with stronger credit ratings could limit management's ability to scale up acquisitions to maintain its growth rate. Overall, Realty Income appears to have low fundamental risk. Realty Income’s predictable cash flow, strong balance sheet, disciplined approach to acquiring properties, portfolio diversification, and access to low-cost capital make its dividend among the safest of any REIT’s. These factors also help ensure that management can keep growing the business (and the payout) for the foreseeable future – regardless of where interest rates or the economy turn. Simply put, Realty Income is arguably the most reliable monthly dividend stock in the market for conservative investors seeking a blend of current income and moderate but dependable payout growth.